SPW040641 SCOTLAND (1932). 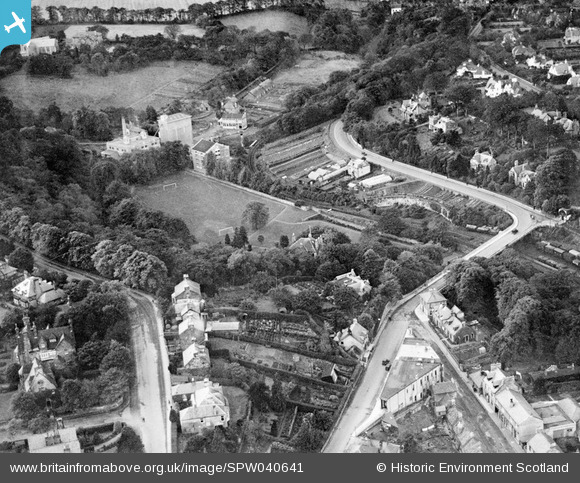 Edinburgh, general view, showing Spylaw House and A and R Scott Porage Oats West Mills, West Mill Road, Colinton. An oblique aerial photograph taken facing west. © Copyright OpenStreetMap contributors and licensed by the OpenStreetMap Foundation. 2019. Cartography is licensed as CC BY-SA. Title [SPW040641] Edinburgh, general view, showing Spylaw House and A and R Scott Porage Oats West Mills, West Mill Road, Colinton. An oblique aerial photograph taken facing west. © Historic Environment Scotland. Scottish charity number SC045925.